Chicago—ALA Publishing eLearning Solutions announces a new iteration of our popular eCourse, How to Implement a Digitization Program. Susanne Caro will serve as the instructor for a 4-week facilitated eCourse starting on Monday, Nov. 5, 2018. Digitization is a rapidly growing area of librarianship. Whether you’re a community repository or you need to digitize old materials to save space, the ability to start a digitization project is becoming an essential skill for the modern librarian. 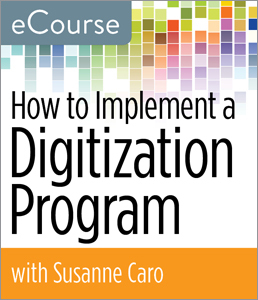 In this eCourse, Susanne Caro, a former state documents librarian and digitization expert, shows you what you need to get started if you are new to digitization. Through hands-on exercises and instructor interaction, you’ll learn about how to assess different materials for digitization as well as how to get buy-in and resources for your project. You’ll become familiar with different tools that can help you do the work. Access options: independence or collaboration? Susanne Caro is the government document librarian at the University of Montana, Missoula. She has presented at library conferences regarding how to access digitized educational resources. Previously she was the state document librarian and coordinator at the New Mexico State Library where she planned and implemented the creation of a digital collection of El Palacio magazine, the oldest museum publication in the country, dating back to 1913. Registration for this ALA Publishing eLearning Solutions facilitated eCourse, which begins on Nov. 5, 2018, can be purchased at the ALA Store. Participants in this course will need regular access to a computer with an internet connection for online message board participation, viewing online video, listening to streaming audio (MP3 files), and downloading and viewing PDF and PowerPoint files.